A mix of hardy herbaceous and borderline hardy sub-shrubby ones. We just grow the ones we like and grow well for us! 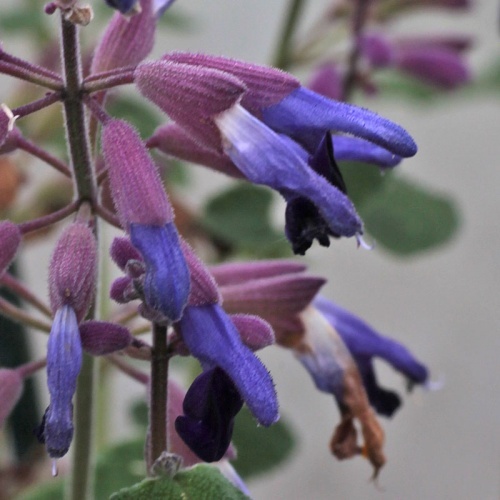 Salvia is another very large genus where it would be impossible to grow all of them due to the numbers and the varied conditions they require. 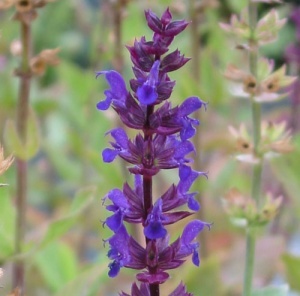 We have a small selection, mostly of hardy herbaceous types, that have proved to be well worth growing over the years. 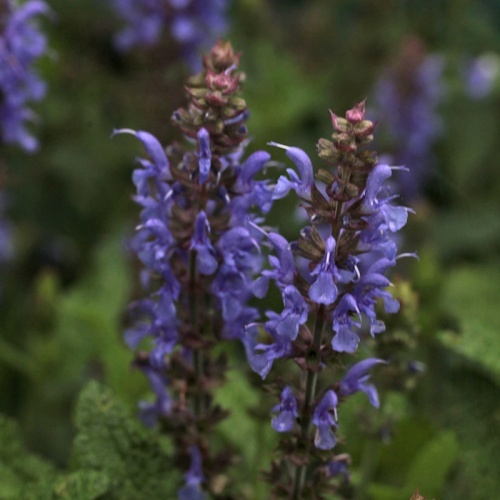 The herbaceous types are mostly forms of the British native Meadow Sage or Meadow Clary, Salvia pratensis, the hybrids of Salvia nemorosa and some selections of Salvia verticillata. These are all good garden plants that will thrive in ordinary soil in sun with reasonable drainage, the drainage is key - a waterlogged site in winter will cause losses. 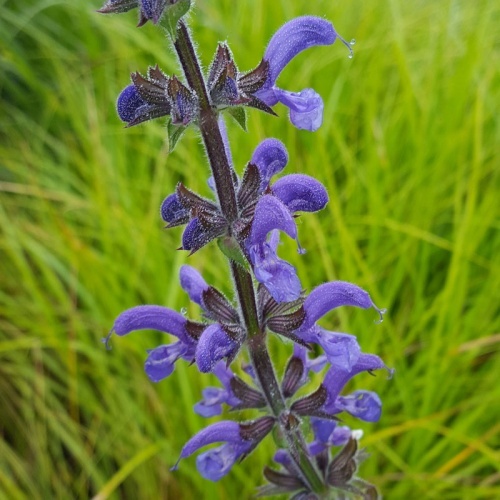 These Salvias all start flowering in late spring and will continue through most of the summer and into autumn, and provide a good winter seedhead from many of them too. 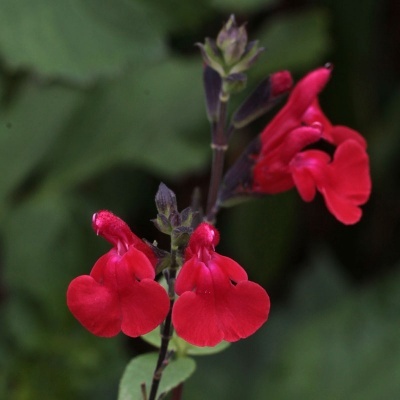 The less hardy types include forms of the shrubby Salvia microphylla and Salvia x jamensis (central Americans) and the south American Salvia guaranitica and Salvia uliginosa. 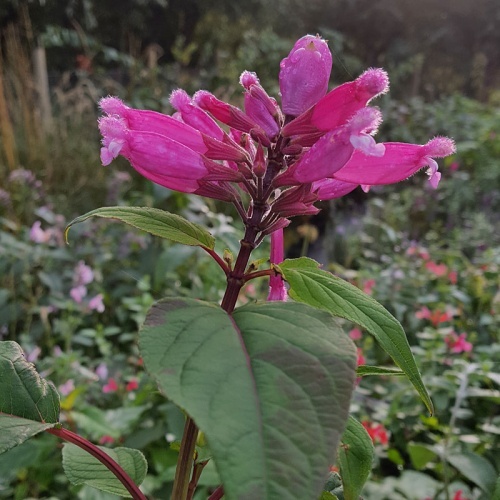 These will usually all be hardy in sheltered gardens, especially if planted with a mulch of composted bark or similar around them. Many people like to grow them in pots and containers though and these will need the protection of a cold greenhouse or similar in winter. AGM. 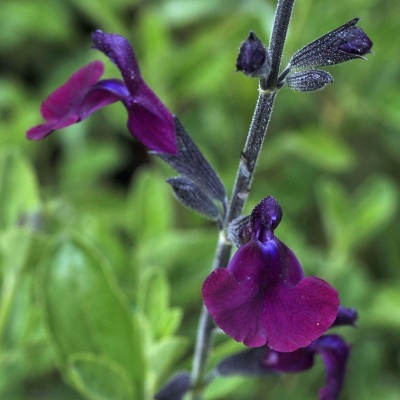 Luxurious deep purple flowers all summer and autumn on this excellent, hardy, shrubby sage. Slightly suckering so able to survive colder winters. Drained soil in sun. 60cm. 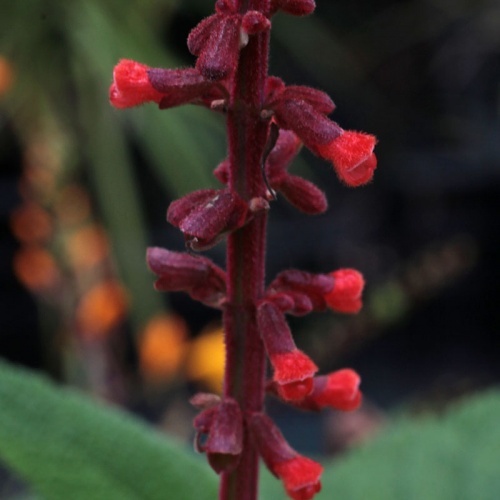 Bright coral reddish-pink flowers over a long season on this fairly hardy shrubby Mexican hybrid sage. Full sun and well drained soil out of cold winds. 75cm. 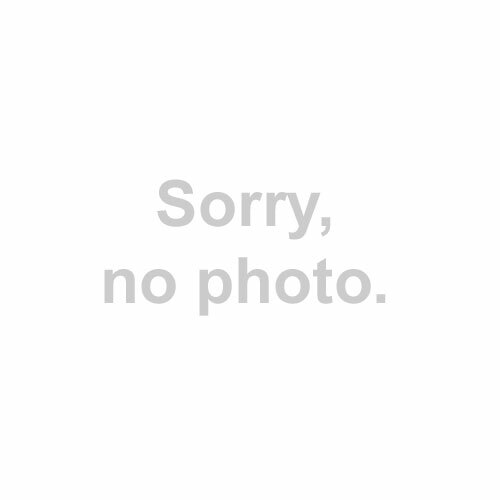 A bushy upright subshrub. 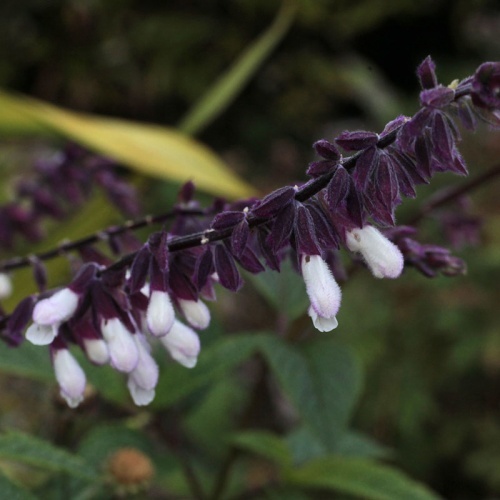 Evergreen in a sheltered site, with spikes of blue-purple and white flowers in summer to 60cm. New to us so not sure on hardiness but it survived -16 with minimal protection! Syn. 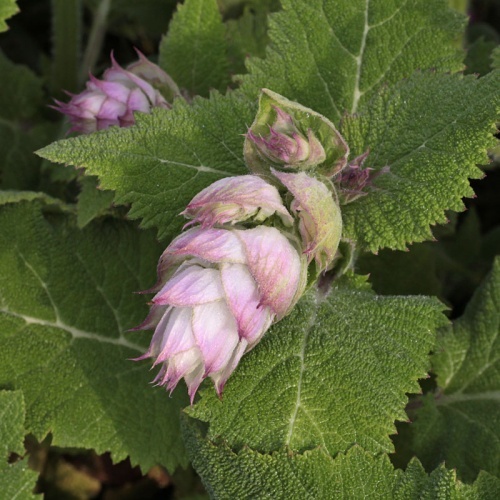 'Hardy Form'. 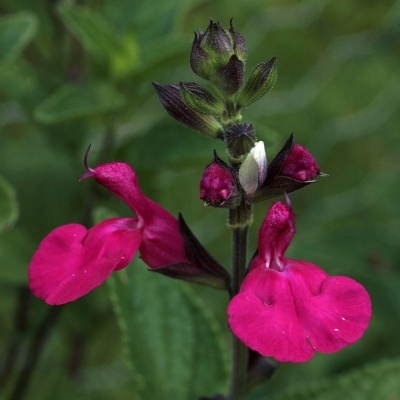 New to us but supposedly hardy form of this spectacular sage with upright spikes of big bright pink tubular flowers that will arch over as they mature. Reddish stems and veins. Well drained, warm sheltered position in sun. 1.5m. AGM Brilliant glowing magenta pink flowers on a bushy plant to 60cm. Leafier than some types. 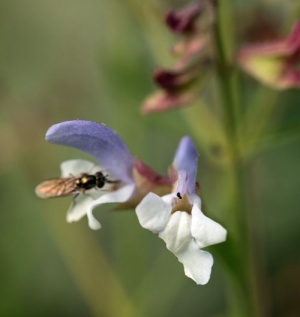 For a well drained soil in full sun and a sheltered position. 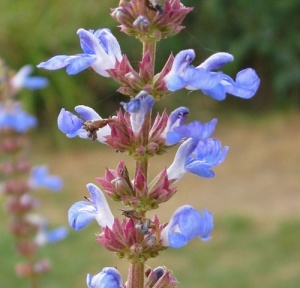 Wands of mint-like growth are topped with bright blue flowers in autumn. 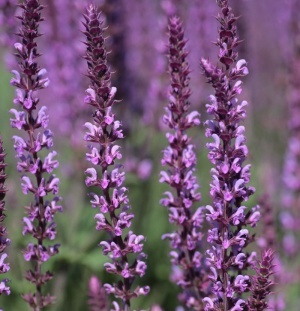 Hardy if planted deeply and mulched in most areas. Moist soil in sun. 1.5m. 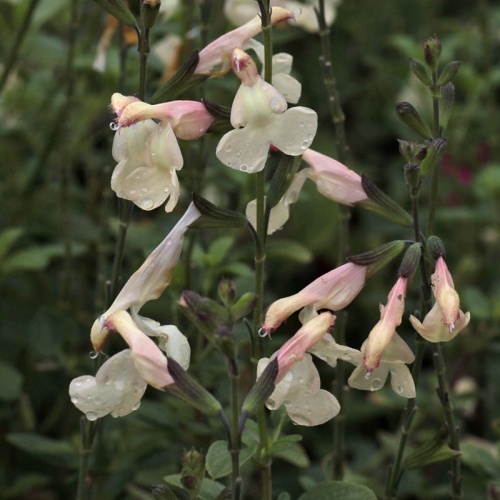 One of the older introductions of this hybrid with lovely pale yellow flowers all summer and into autumn. Well drained soil in a warm sunny spot. 50cm. 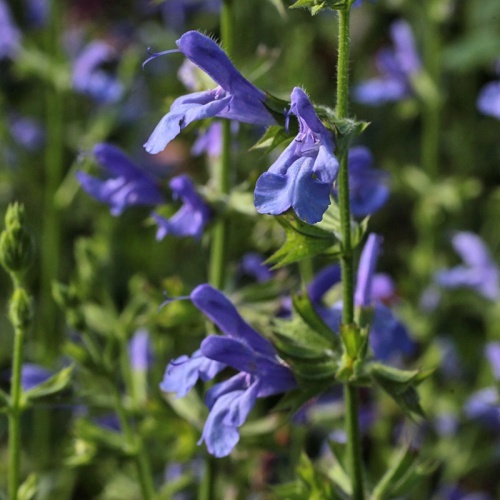 AGM An excellent clear blue form producing many spikes of flowers from May until midsummer and then sporadically later. Can be cut back after the first flush to promote more. Drained soil in sun. 40cm.